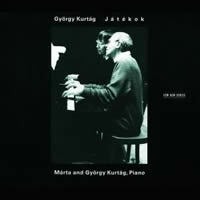 György KURTÁG: selections from Játékok (1973 to present); J.S. Bach transcriptions. Márta Kurtág, György Kurtág (pno). ECM 1619 (http://www.ecmrecords.com/). György KURTÁG: selections from Játékok (1973 to present). Gábor Csalog, András Kemenes, Ha Neul-Bit, Alíz Asztalos (pno), Márta Kurtág, György Kurtág (pianino). Budapest Music Center Records BMC CD 123 (http://www.bmcrecords.hu/). 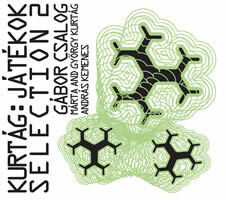 “Játékok Selection 2.” György KURTÁG: selections from Játékok (1973 to present). Gábor Csalog, András Kemenes, Alíz Asztalos (pno), Márta Kurtág, György Kurtág (pianino). Budapest Music Center Records BMC CD 139 (http://www.bmcrecords.hu/). Kurtág’s Játékok (Games) is a vast, continually expanding universe of piano pieces, some of which can be played on organ or harmonium. Compatriot Bartók’s Microkosmos would be the clear precedent, as Kurtág started with pedagogical aims. Indeed some Játékok pages explicitly extend the senior Hungarian’s gestures and rhythms, e.g., Double notes (III: 22; “Addition to [Bartók’s] pieces Nos. 66 and its appendix, and to 134-135…”). As the years have gone by, Játékok (seven published volumes with at least two, possibly others, in preparation) has come to express Kurtág’s worldview through homages, in memoriams, calling cards and birthday greetings. Later volumes bear the subtitle “Diary entries, personal messages.” Most pieces, occupying less than one page, require study to internalize the rhythms and the frequent large jumps. Játékok’s first volume is largely clusters and glissando gestures, requiring deciphering colored inks and symbols. There are several introductory pages of “Basic Elements.” An aspiring child shouldn’t be put off by the 88-keyed monster. Near the end of I, the Hommage à Tchaikovsky spoofs the Piano Concerto No. 1’s celebrated opening with clusters instead of D-flat chords. Eventually the pieces settle into more conventional notation, though each requires mastery of some particular tic. Melodic shapes, the hands’ physical motion, symmetry/asymmetry and coordination/non-coordination are themes Kurtág develops. Some pieces address the musician’s persona, such as the two-person Beating — Quarrelling (VIII) whose alternated repeated pitches force the players to intrude into the other’s space. Titles, dedications and allusions look to other composers. Bartók, J.S. Bach and Webern are the easiest influences to spot. As my exposure to Játékok increases, I’ve noticed the prevalence of sudden paroxysms, violent or expressive. While invisible on recording, in all likelihood, the pianist’s motions are also significant. The ECM album offers the subtitle, “A Composed Program.” The Kurtágs play with noble incisiveness. ECM captures overtones and a robust piano. In the Bach transcriptions sprinkled throughout, the couple’s articulation and phrasing are spine-tingly sublime. Kurtág’s Bach transcriptions employ wide spacing and other doubling tricks to delineate the lines. Some two-piano and four-hand pieces may have precise pitches but unsynchronized rhythms. After hearing the Kurtágs in Zorniger Choral (“Furious Chorale,” IV: 2), you may wonder how they manage to do it. On the BMC series, Csalog is the primary pianist in 58 tracks on the first disc and 52 on the second. Some pieces are programmed twice on the second release. Because the recording information is the same for both releases, it would seem that an intégrale is underway. The Kurtágs take a few selections now and again, and other guests offer a third hand or sit at a second piano. Some play and speak. Close attention shows that the Kurtágs are more penetrating than Csalog, who tends to dash through. As much as I adore BMC’s presentation, the older ECM release would be my recommended port of call into Játékok, though perhaps the best way is to attempt a selection oneself. “Kurtág: 80.” György KURTÁG: …concertante…, Op. 42 (2002-03, rev. 2006); Hipartita, Op. 43 (2000-04); selections from Játékok and Transcriptions (1973 to present). György KURTÁG and György KURTÁG, Jr.: Zwiegespräch (1999-2006…). Hiromi Kikuchi (vln), Ken Hakii (vla), Hungarian National Philharmonic Orchestra, Zoltán Kocsis (cond. 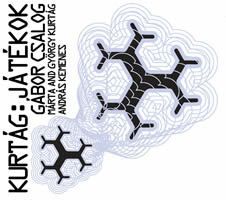 ); Keller Quartet: András Keller, János Pilz (vlns), Zoltán Gál (vla), Judit Szabó (vlc), György Kurtág, Jr. (synth); Márta Kurtág, György Kurtág (pno). 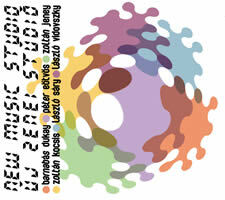 Budapest Music Center Records BMC CD 129 (2 CDs) (http://www.bmcrecords.hu/). Husband and wife conclude Kurtág’s 80th-birthday release with a garland of Játékok selections, Bach transcriptions and one Bartók duet. Here they play on a muted upright piano to delicately constricted effect while György Kurtág, Jr. manipulates amplification. Reflecting their years of partnership, the Kurtágs’ playing is spectacularly poetic. The three concluding encores repeat one Játékok excerpt and two Bach transcriptions. If Játékok’s miniatures and elegant Bach transcriptions entrance, the other Kurtág works may baffle. Perhaps the piano was muffled for reasons other than timbre: The violence that lurked in the piano works steps stage-front in the sweeping …concertante…, garden-variety modernism along the lines of Sciarrino, Grisey or Rihm. Scored for solo violin and viola with orchestra including cimbalom, …concertante… is as remote from Mozart’s Sinfonia Concertante, K. 364, as can be imagined. Naked solo wisps may be countered with orchestral timidity or bombardment. Towards the end, the soloists engage in a descending scale, perhaps a reference point. I pick up on a mix of brusqueness and refinement suggesting hostility. Father and son’s Zwiegespräch is a magic-carpet ride for string quartet and synthesizer. The synth adds extracurricular effects to mostly hesitant string writing, typical of Kurtág’s quartets. The composition operates as a duo between quartet and keyboard, old and new, father and son. Together they exceed the sum of their parts. Sometimes the quartet’s material will repeat as if adjusting to a gravitational pull as the synthesizer splashes and dips. Hipartita’s solo violin wanders through eight pieces arrayed on eleven music stands, suggesting works by Nono. György Kurtág, Jr.’s program notes imply differing degrees of amplification for each of the pieces. Despite the high concept, this is the set’s least successful work. Closing the second disc, the piano duo elevates the entire release. Really, someone ought to get the Kurtágs in the studio and just let the tape roll. “Kurtág’s Ghosts.” Var. comps by György Kurtág (selections from Játékok), J.S. Bach, Béla Bartók, Ludwig van Beethoven, Pierre Boulez, Frédéric Chopin, Joseph Haydn, Leoš Janáček, György Ligeti, Franz Liszt, Guillaume de Machaut, Olivier Messiaen, Modest Mussorgsky, Henry Purcell, Domenico Scarlatti, Franz Schubert, Robert Schumann, Karlheinz Stockhausen. Marino Formenti (pno). Kairos 0012902KAI (2 CDs) (http://www.kairos-music.com/). Distributed in the US by Allegro Music (http://www.allegro-music.com/). Having met Formenti before, I eagerly set upon this release with great hopes. However, thinking about why this program does not work is almost more enjoyable than actually listening to it. To play Kurtág was Formenti’s primary goal. He identifies Kurtág’s heritage as “Ghosts” and introduces theater. The two-CD journey (47:20 + 56:18) begins inaudibly with Machaut’s Loyauté, que point de delay. I had to turn up the volume for the first tracks and then reset after the fourth piece. The 70 tracks clump into regions. One stretch relates Kurtág to Stockhausen, Messiaen and Boulez. 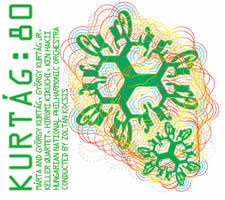 Then there’s Kurtág’s elusive Hungarian sound: Bartók and Ligeti with traces of Schubert and Beethoven. Later Formenti grows wistful among a clutch of Kurtág homages and in memoriams anchored with Schumann. As much of Kurtág’s Játékok are “in the style of,” “dedicated to,” or “in memoriam,” the implicit interconnections plead for illustrations. When Kurtág is matched with a single composer, such as J.S. Bach in the BMC releases, the contrasts and dependencies grow evident and the program matures. When Kurtág cavorts across Music History’s color wheel, the confusing results raise issues of style. Kurtág is comfortable in pithy forms assembled randomly, whereas the other composers are simply excerpted. It’s as if we’re shadowing an insecure debutante who must name-drop at every opportunity. I don’t think that’s what Formenti had in mind. The antics do not stop after the opening fade-in. Formenti glides from one piece to another without pause to startling and sometimes upsetting effect. Perhaps it’s humorous to hear how easily Stockhausen’s Klavierstück No. 2 can elide into Messiaen’s Île de Feu 1 or how Ligeti and Bartók relate, but the attaccas between Bartók’s Hungarian Peasant Song, Op. 20 No. 5, Beethoven’s nine-second-long Bagatelle Op. 119 No. 10, and Bartók’s Rumanian Folk Dance No. 6 produce cognitive vertigo. 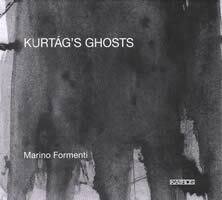 The Baroque-Classic pieces (Scarlatti, Bach, Schubert, Beethoven and Schumann) aren’t Formenti’s best efforts. It says a lot about Schubert’s durability that his two entries emerge as oases despite Formenti’s brusque treatments. Similarly the two Scarlatti sonatas with their explicit repeats and idiosyncratic gestures permit a few moments of relaxed breathing before slamming into the next curt Kurtág. The Schumanns in the program’s last act, six pieces overall, leave a messy residue. A single Bach prelude is simply sloppy. Rather than a thoughtful program, Formenti’s effort immediately reduces to a glossary. The booklet’s interview between Formenti and co-producer Peter Oswald tells us that Kurtág was influenced by compatriots András Mihály and Emil Petrovics. Wouldn’t it have made sense to include such less familiar music? Formenti’s passion and vivacity work well where folk elements come into play. It would have been more rewarding had the concept taken that direction. “New Music Studio / Új Zenei Stúdió.” Zoltán JENEY, László SÁRY, László VIDOVSZKY: Undisturbed (1974). Barnabás DUKAY: To the changing Moon (1975). Pétér EÖTVÖS, Zoltán JENEY, Zoltán KOCSIS, László SÁRY, László VIDOVSZKY: Hommage à Kurtág (1975). Ensemble of New Music Studio, Auer String Quartet, Somogyi String Quartet, András Wilheim (cond.). Budapest Music Center Records BMC CD 116 (http://www.bmcrecords.hu/). Inspired by Cagean chance, Új Zenei Stúdió (ÚZS) brought together a handful of composers and performers in 1970s Hungary. Unstructured, chaotic music incurred officialdom’s wrath. Undisturbed’s October 14, 1974 premiere nearly led to the group’s demise. It spins three independent wheels: Vidovszky’s four pianos, Sáry’s music for strings, and Jeney’s pieces for prepared piano, percussion and tapes. The next year in a concert intended to celebrate Kurtág’s 50th birthday — which couldn’t have been publicly acknowledged — ÚZS performed the group piece Hommage à Kurtág and Dukay’s To the changing Moon. Ten years later, they recorded the Hommage: Eötvös contributed an early version of his Windsequenzen for harmonium, flute, English horn, bass drum and wind sounds; Jeney brought electric guitar, tam-tam, cimbalom, harpsichord and tape; Kocsis wrote for organ, strings and prepared pianos; Sáry provided multiple pianos; and Vidovszky scored a violin choir repeating a dissonant melody. This recording presents Undisturbed’s premiere which never made it to LP or radio play, a 1975 recording of Hommage à Kurtág, and a 2005 taping of Dukay’s To the changing Moon for string octet.